Sleeping outside invariably means waking up early with the dawn. The two Serenas had already left before sunrise keen to cover the kilometres and to avoid the heat of the day. 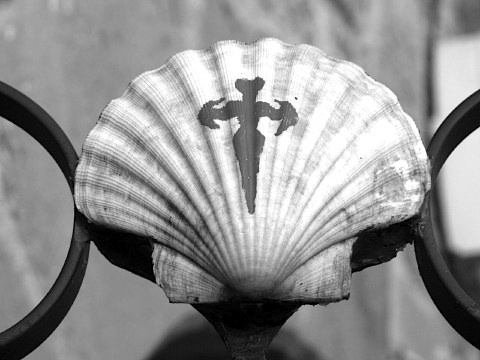 Ray was more relaxed and set off later while I stopped to admire the Church of Santiago and its iron scallop designs. Triacastela was the end of the eleventh stage of Aymery Picaud’s guide and with only two more stages to go, I was soon to be within 100km of Santiago de Compostela. I wanted to get there but still wanted to enjoy the slow pace of the long walk. I took some breakfast at a small cafe. 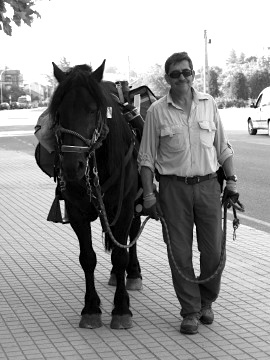 Ray joined me before we set off – he had been looking round town. Outside Triacastela there was a choice of routes. Many took the slightly longer route that curved to the South via Samos. 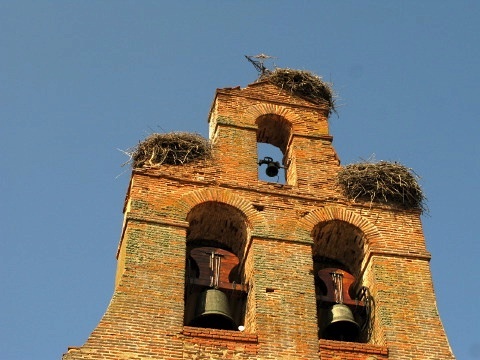 In Samos there was a very large Benedictine Monastery, now a Spanish national monument. There used to be over five hundred monks based at the monastery. Only a few remained today. For a while we could not decide whether to take that route. The other route was a slightly shorter, more strenuous and hilly route via Saint Xil and other small villages. Eventually we opted for the latter. The climb was on a good path through dappled shaded woods. The heat was slowly building and the shade protected us from the strong sun. I was however very humid under the canopy. The Way climbed steeply on leaving town. 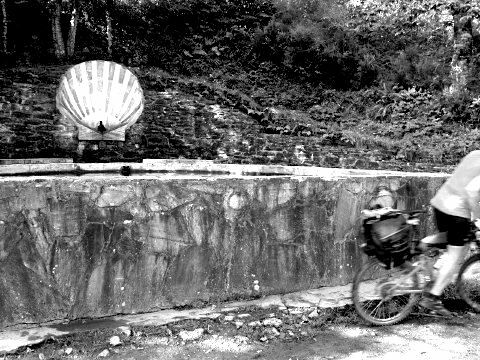 Just before Saint Xil there was a fascinating fountain and seating area where some time was spent sampling the fresh spring water flowing enthusiastically from the hillside. Ray and I continued walking and chatting together for some time. The country was wonderful and I was glad to have taken the higher route as the views down and along the valley towards Sarria were superb. It was easy walking as the whole way after Saint Xil was downhill. It was a very long descent of many kilometres before we reached Sarria. Stocking up on some lunch, I searched around for a camera shop to purchase another memory card for the camera. 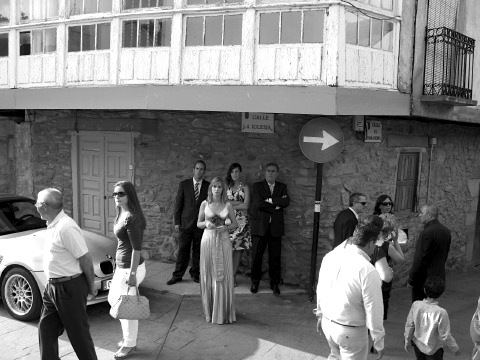 All the camera shops were closed until 4pm so we waited at the foot of the steps leading to the centre of old Sarria. After lunch Ray decided to continue while I waited for the shops to open. On the corner there was a small shop that specialised in selling all sorts of useful clothing and supplies for pilgrims, including memory cards. Happy to be able to take photos again I continued on. Soon I passed a strange self-service room full of vending machines selling food and drink. Galician music was blaring out and there was no one around. 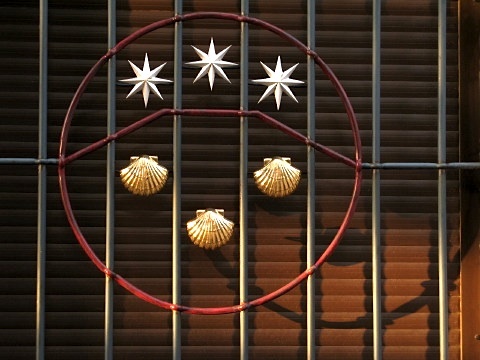 CCTV cameras surveyed the room, and I was endlessly amused that a separate vending machine was selling Saint James scallop shells! 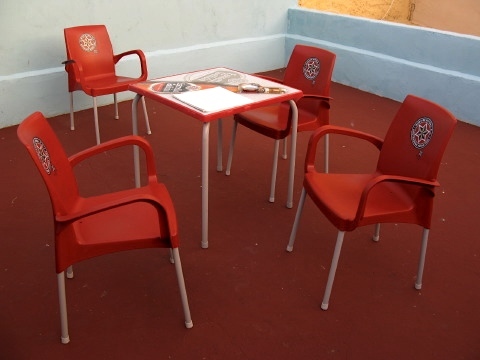 The albergue in Barbadelo was basic and clean. The lady there was a little officious as she read out the rules. She advised that I could use the kitchen but that there were no plates, cutlery or pans. 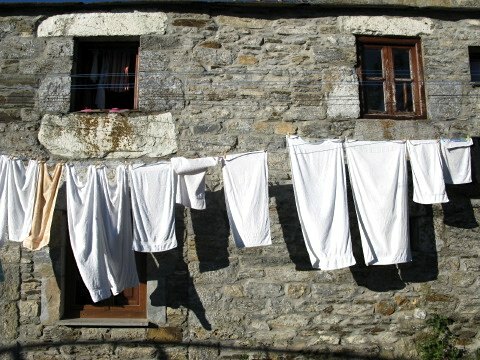 When I enquired why there was a kitchen but no utensils, she simply said that ‘those were the rules’ as she impatiently pointed to the wall poster detailing the Albergue Rules of the Junta of Galicia. Instead I sat on the steps with my gas stove and cooked up some chicken soup. Eva, Ray and others were there and we all chatted and shared what food we had. In a field opposite the albergue was a caravan selling beers and snacks. They had even set up a huge tent with a television for the World Cup final in a few days. 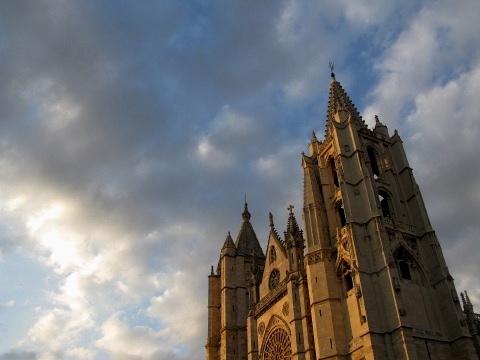 Again I reflected on the contrast of the traditional Camino with today’s modern world. Junta rules dictated a strict 10pm lights out at this albergue so there was no choice but to take a welcomed early night. All was misty, cloudy and quite strange when I awoke. It looked like a day of walking in the clouds but after breakfast the view was fantastic. 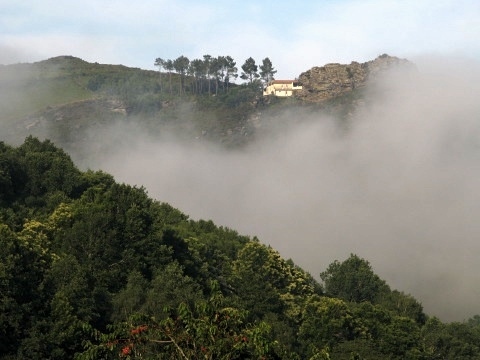 The cloud had receded and was sitting in the deep valleys below O Cebreiro. The sun glowed strongly over the cloud and made for a very mystical view. Everyone was amazed by the scene and by the atmosphere on that special morning. I was inspired by the prospect of being on the final leg of my journey after so many weeks of daily walking. It was now only a few days to Santiago de Compostela. I looked at the distance to go and worked out how many days it would take. 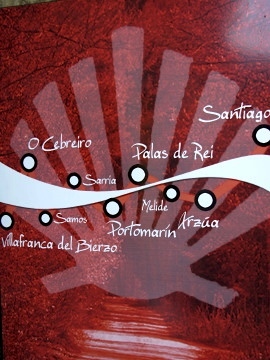 I did not want to reach Santiago too soon as I was enjoying the experience of this great journey. Maybe four or five days – I was getting excited. There was a rush of reflections about all the great experiences I had had on the way. 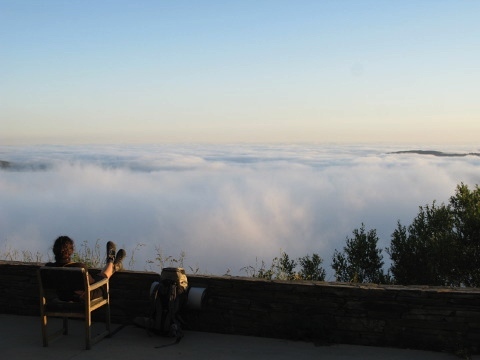 It was a time to sit and gaze over the clouds and remember all the good times as well as the inevitable difficulties during the down times. Setting off, it was an easy descent from O Cebreiro. Many took the road however the marked way into the hills seemed more appealing. From the village the Camino wound through moist pine woodland following the contour of the hillside before dropping sharply to meet up with the road. There was a small garage and supermarket at the junction. It was filled with fascinating foodstuffs and country supplies. The mechanic served me a coffee at the long wooden bar that ran along one side of the supermarket. An unusual and interesting place. After a short time following the road, the Way headed off onto a more pleasant countryside path. 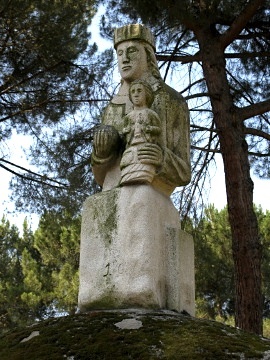 It climbed through many small hamlets before reaching the Alto de San Roque at 1270m. 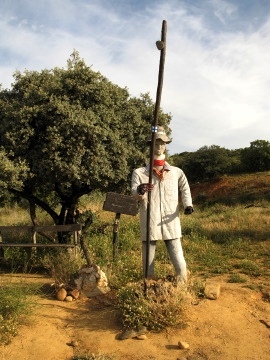 At the summit was a modern statue of a pilgrim posed to fight the winds and challenges of the Camino. Soon after I met a group of young scouts from Ypres in Belgium. They had been camping the previous night at O Cebreiro. I had seen their tents pitched on the outskirts of the village there. We walked and talked together for a while. They were enthusiastic and refreshing in their observations of their experiences. I scoffed slightly when they told me they took a day off every three days in case they became tired. They were all teenagers up to about eighteen years old and seemed healthy enough! Perhaps the older pilgrim has more experience and stamina! Soon after the scouts stopped for lunch in Viduedo and waited for the support van to arrive to cook up some lunch. I felt that though it was a good experience for them, it may have been better to let them live a little more like a real pilgrim by walking each day supplying themselves with their own food. Living some of the difficulties. By now all the cloud had dissipated and the heat was slowly building. 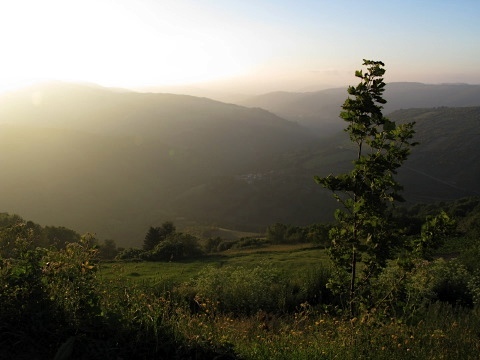 After the heights of the mountains, it was a steady descent from high above the valley before descending through the wonderful rolling green lands to the town of Triacastela. It would be a little over 22km today, not a lot however a good day’s walk all the same. I would arrive early and was looking forward to spending the night outdoors by the river. I had heard from others that there was a great camping spot under the trees by the river there. The Camino was getting busier. 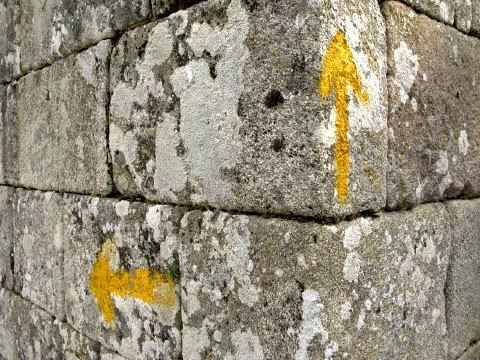 The increasing number of walkers and pilgrims were supplemented by the ‘tourist pilgrims’ – those who walked the last one hundred kilometres or so to Santiago de Compostela. 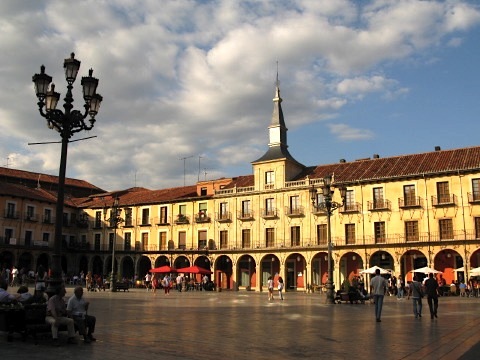 Many Spanish view obtaining the Compostela as an important part of their life and even list the achievement on their resume when applying for jobs. Needless to say, some only did what was necessary to obtain the Compostela. Only walking one hundred kilometres would entitle them to the certificate. 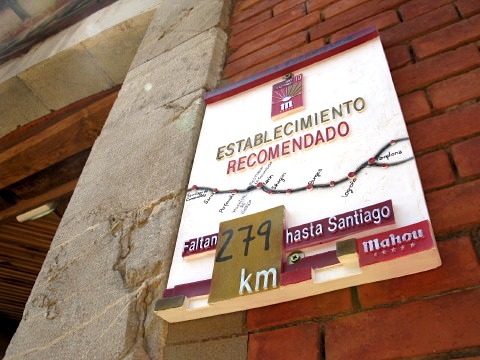 Two hundred kilometres are required to obtain the Compostela if travelling by bike. Some of course took the bus and tried to get the Compostela that way. Some long distance walkers felt a little cheated that after such an effort, the beds were taken by these ‘tourist pilgrims’. Tourism had taken over from Tradition for some. Sure enough, when I arrived at about 4pm in Triacastela all the albergues were full. I heard too that the police were preventing people camping by the river. This was the first time I had found difficulty in obtaining a bed. 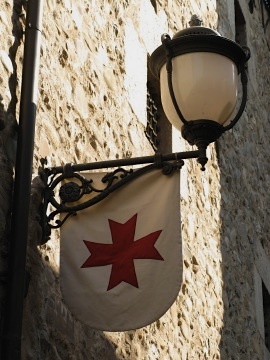 I walked round town visiting the many albergues. They were either full or very expensive. 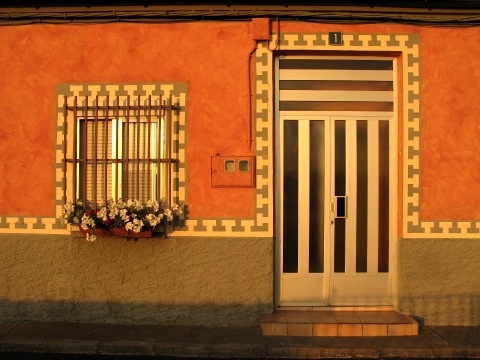 Other parts of Spain had charged about €5 per night. From now on it would be more like €9 – €12 per night. The people were also a little less relaxed. I could only assume that they were a bit jaded by the large number of pilgrims that passed through their town each year. 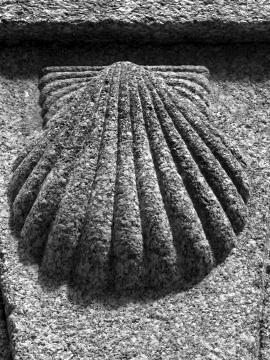 The spirit of the Camino seemed to have lost a little of it’s magic after Triacastela. Until now the Camino had been much more peaceful. Maybe my walk had indeed ended at the Iron Cross. Eventually I returned to the municipal albergue, complete with its temporary Galician Government medical centre to treat the ills of the modern pilgrim. I paid €5 to sleep outside and to use the facilities for the night. The two Serenas and Ray were in the same position and we all agreed to camp down together that night on the grass next to the albergue. I met up again with Ricardo and Daniel who I had last spent time with in Reliegos. Earlier the police had moved them on from their riverside camp ground. Camping ‘wild’ in Galicia should be undertaken with care as the police are a bit more strict than in the rest of Spain. Understandable I suppose with the huge number of walkers that undertake this last stretch of the Way. Ricardo and Daniel were now camped on the hill near the albergue and were enjoying a bottle of Rioja between them in the last light of the day. We chatted for a while before laying out our sleeping mats, bags and bivis with the others on the soft grass. It was a wonderful night under the stars and not too cold. I never have a problem sleeping under the stars! 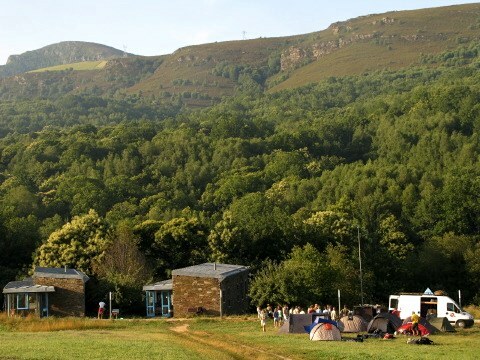 TIP: ‘Wild’ camping is possible along the Way however the police in Galicia are a bit more strict about this practice. Choose your spot well out of site! Serena, Serena and I woke early on the terrace of our makeshift outside ‘albergue’. It had been a cold night but we survived! It was not yet light as the man from the cafe arrived to open up. We thought it best to pack up quickly. Were we in trouble? He simply said ‘Good Morning’. As we packed up, two of the local Civil Guards arrived for their morning coffee. Now we were really in trouble. Visions of being marched to the local police station filled our minds but no – a kind ‘Good Morning’ followed. It was although it was perfectly normal to sleep on the terrace of the cafe! After quietly going inside we had some coffees and cakes before setting off. We all put a stamp in the Credencial as proof of our ‘different’ night of accommodation on the Camino. It had to be done! We were near the top of the long valley and it was not long before the sun rose to show us the way. 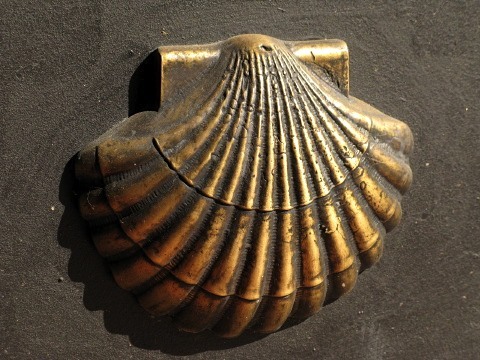 Without notice one Serena said ‘How you live the Camino is how you live your life’. It took me aback and I thought about her words for a very long time. I had developed a new blister again on top of another blister. I was walking slowly. It was probably due to the huge number of kilometres I had completed the day before. I decided to slow down and stop. The two Serenas continued on their way. I was sure I would see them again soon. Our pace was similar. 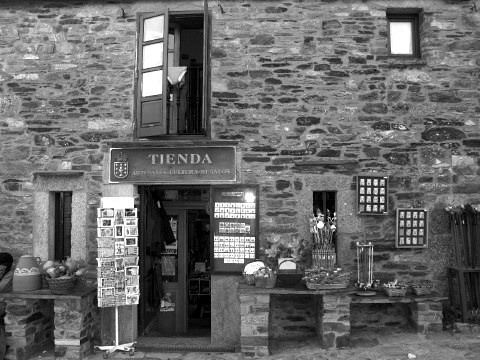 I stopped in the small village of Trabadelo at a cafe. I cleaned the left foot and dressed the new blister on the heel. While I was doing so Bernard and Pascal arrived. I had not seen them for quite a while and it was good to meet up again. They went on at a faster pace than me after I told them about my blister handicap. I was hobbling slowly and did not want to delay them. The Way followed the old main road. The motorway was still there and the old road was relatively empty. There was a succession of small villages with little activity. 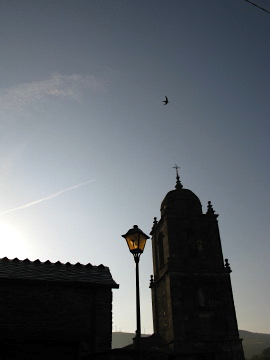 The architecture was a little different now – it was not far to the border with Galicia. 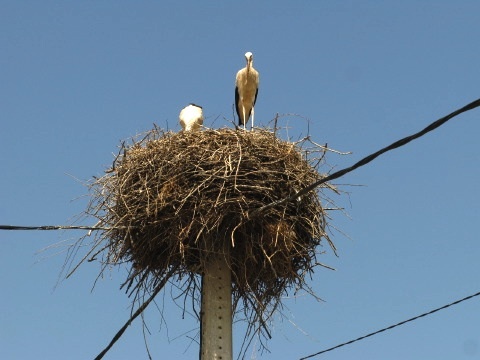 Occasionally I heard a different language from the some locals in the small villages. Galician writing on posters and shops was more like Portuguese. I was running low on cash so made a point of looking out for a cash machine. Did I find one? No I did not. I had €12 left. At the village of Hospital it was now very hot. I stopped for a cold drink. I could not see where the Way went. Ahead was only a steep wall of mountains covered in forest. There was a fountain fed by the small river. I soaked myself with the cool clean water. Covering my clothes and hat with the cold water, I drank at least a litre of the cold liquid. What followed was a surprise and a struggle. The Way suddenly climbed up the hillside at an incredible angle. It was the steepest ascent since the Pyrenees and exhausting in the heat of mid-afternoon. Many were walking slowly, many were stopping to rest, sweating and panting with the challenge of the climb. For a lot of Pilgrims, this was the first few days of their walk. 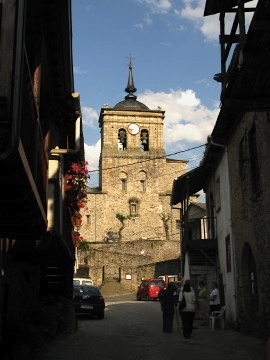 Villafranca del Bierzo was a popular starting point for many. They did not yet have the fitness of those who had been walking for many days or many weeks. At La Faba there was a small shop where everyone stopped to catch their breath and comment on just how difficult the climb had been. More water was drunk in the shade of the grand old trees surrounding the village. We soon discovered that the climb was not yet over. It was over an hour and a half of steady steep climbing before the next stop. The track was very rough with large rocks and a dangerously loose surface. It was not easy walking. I met an elderly lady with her bicycle that I had met many days before in Granon. She had been advised by the Police to take this route and was cursing their advice! It was not at all suitable for a bicycle or indeed any elderly pilgrim. I stopped at La Laguna. The light was fresh and intense as only light at this altitude can be. It was about 1000m above sea level. In the cafe the music was different. I asked the staff and they explained that it was Galician music by a group called ‘Milladoiro‘. It took me back to Scotland as the melodies were similar and there were bagpipes mixed with Celtic rhythms. I stayed a while reflecting on how much I felt at home … yet I was so far from home. It was such a surreal experience to feel like that in a country I knew so little about. The Way continued upwards once more until, after another hour or so, the summit was reached. The view from the top was magnificent. At that ridge I had arrived in Galicia. Straddling the border and looking back in wonder from where I had come and ahead into the mystical land of Galicia. This would be the beginning of the final stretch to Santiago de Compostela. I was filled with an immense feeling of satisfaction that so many kilometres had been covered and that the goal was now so close. Santiago was only five or so days away. 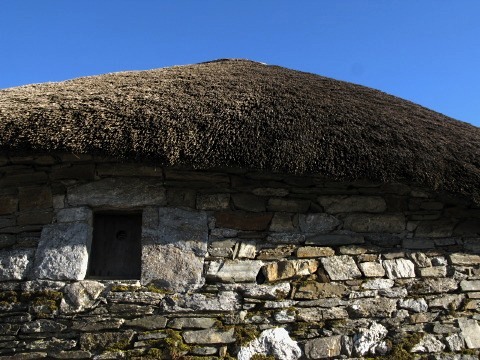 The village of O Cebreiro was fascinating with many ancient pallozas, traditional thatch covered buildings. I met Deirdré again and she lent me €20 without me asking and without a moments hesitation. I could eat that night! I would pay her back later. I just managed to get one of the last of the beds in the albergue. Life was perfect. This would be a strange day! Yesterday when I arrived at the Cruz de Ferro, I felt that my walk was complete. 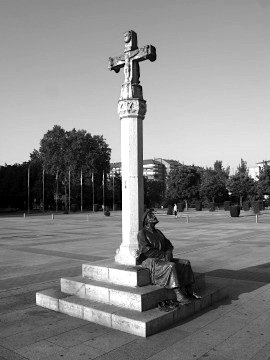 The Iron Cross was like the end of the pilgrimage but of course it was not. At the Cross I felt a lot of emotion. A lot of loss and a lot of anguish. I was aware that I was leaving something behind. I tossed my stone on the mound and spent a lot of time in reflection. As I walked away, I truly had left some memories of the past and past relationships behind. There was no other day on the Camino where I felt so much emotion. I felt my arrival at the Cross was the end, and a new beginning. I cannot explain it more clearly. 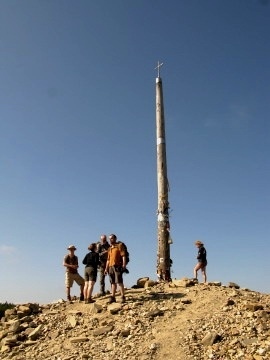 I had met others that found the Cruz de Ferro a significant place for them on their Camino. This morning I met up with some Brits soon after Molinaseca. At a cafe in La Borrecca, many had stopped for their morning coffee. 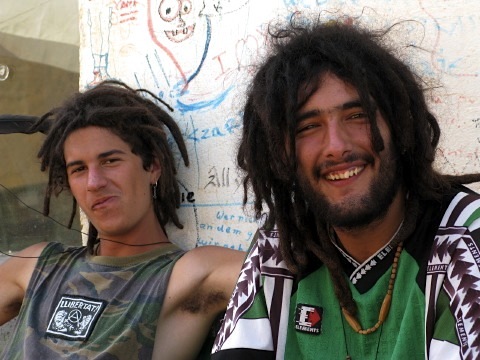 There was Alice and Francois from England, and an Ozzie guy from Maroubra, Australia. Francois, from Lewis, near Brighton, was a photographer amongst other things. An interesting guy, he was totally absorbed with the Camino. As we left the cafe Valentin and his horse Cameron arrived. 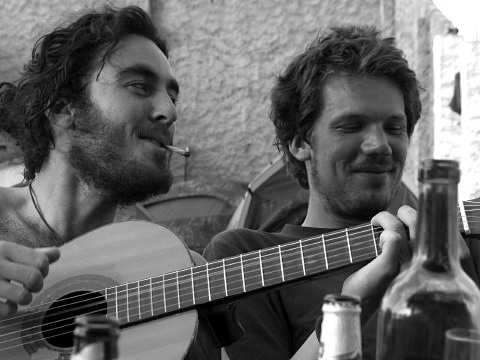 I had met Valentin a long time ago in Puente la Reina and it was good to catch up. In Ponferrada, there was a Medieval festival about to commence. We were early so did not wait for it to start two hours later. 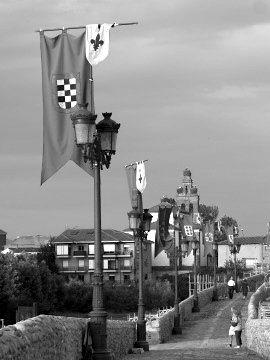 We all walked together through Ponferrada. 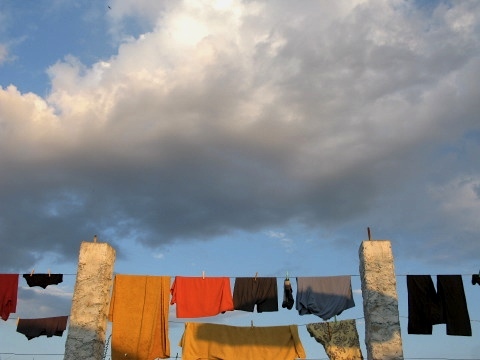 It was always necessary to cover the kilometres before the heat became too much. I bought some bread at one of the few shops that were open. It was Sunday, and all was quiet. 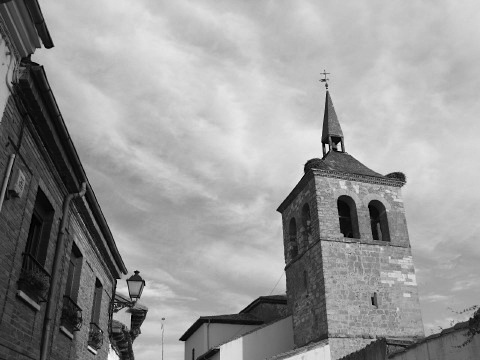 Outside the still sleeping town of Ponferrada, the Way passed through Compostilla which appeared to be a military or police base interspersed with ancient buildings and a variety of intriguing statues. 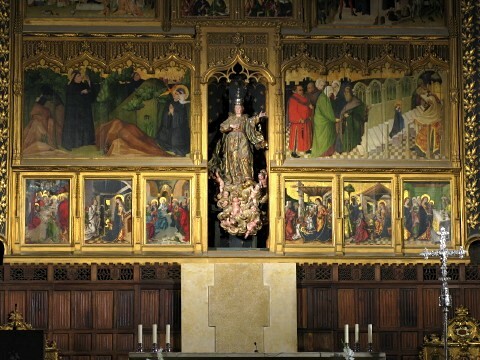 There were statues of the Virgin Mary and Saint James, and some ancient kings I did not recognise. In Camponaraya we stopped for a drink at a small bar. Hunting around, all the shops were closed. Luckily I had the bread so had to make do with the basics. There was a road-side stall selling fresh oranges for €1 each. I objected at the blatant rip-off. There were only a few examples of pilgrims being taken advantage of however it did happen. As Santiago grew closer, and the number of walkers increased, there were more and more people trying to make a living from the humble pilgrim. To be expected I suppose in the world we live in today. 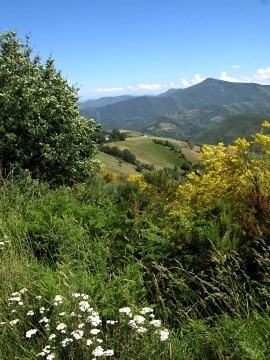 The Camino soon wound down into a small valley through fragrant trees and vineyards. There was a small stream amongst some trees where I rested for a while. The peace was remarkable and it was a welcome stop after the long walk through Ponferrada. Soon after I saw a lady behind me dressed all in white. She had a sun brolly to protect her from the now searing sun. I stopped and waited until she caught up. Gabbi was from Germany and had set off from her home town with her immaculate white track suit and trolley. She was ecstatically happy and recited some poetry. I could not help but be impressed by her journey. She composed poetry along the way taking her inspiration from the Camino and the Pilgrims along its length. She would stop at the next village of Cacabelos. In Cacabelos I had a well deserved beer with Francois, Alice and the ‘Man from Maroubra’. They were also staying the night in town, but I felt there were more kilometres do cover today. While they went off to the albergue, I lay by a wide river and slept for a while. The two Serenas were there asleep in the shade of a large tree. I did not disturb them hoping to speak to them later. I had the most amazing swim in the river. It was a pleasure to wash off the dirt and dust in the cool water that flowed from the distant mountains to the South. Refreshed and ready to continue, I passed the albergue on the way out of town. There were cabins in the ground of a church that served as a stopover for pilgrims. It did not appeal to me that much. I was ready to continue. Not long after the Way diverted from the road again and into the more pleasant vineyards. 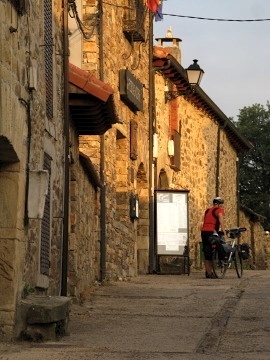 It was late afternoon when I arrived at the tiny hamlet of Valtuille de Arriba. There were only a couple of cafes and I stopped at one to speak to the elderly couple who ran it. They enticed me to sample some local wine from the very vines I had been walking through. 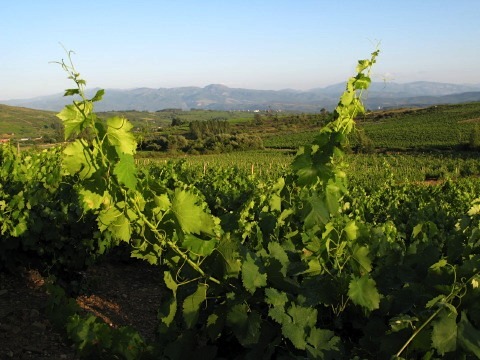 I bought a bottle and continued on passing through more wonderful vineyards of Bierzo. By now the light was fantastic. I sat for a while and admired the views before taking many photographs. I put down the sleeping mat. The peace and silence was wonderful as I relaxed in the vineyard listening to the sounds of the warm afternoon. I was really experiencing and enjoying the simple peace that can be found on this fantastic walk. 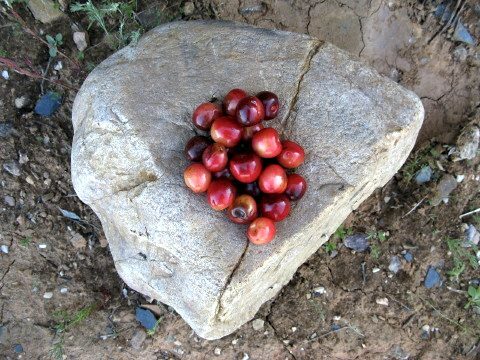 There was a stone with a pile of fresh cherries placed in the middle. I could not understand how they had come to be there as there was no one around and the stone was quite a distance from the track. So, maybe meant for me, I ate the lot. 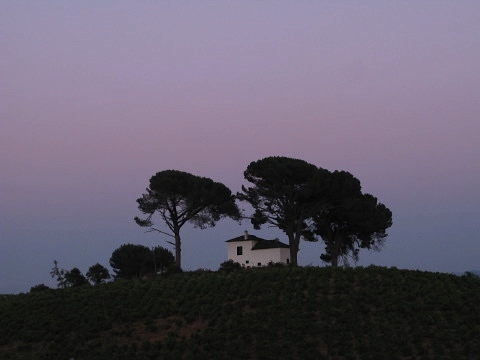 Another hour passed in the vineyards as I took a short dreamy siesta. Taking what I did from the cherry offering, I looked around to replace the cherries I had devoured. There were no cherry trees anywhere in the area. 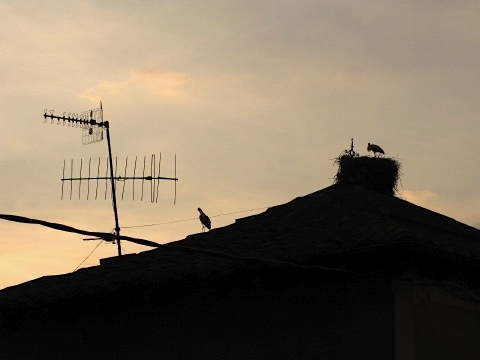 It was almost dark when I started walking again and soon arrived in the town of Villafranca del Bierzo, the ‘capital’ of this former Galician area. I supposed I must have arrived there at about 11 pm and surprisingly bumped into Serena and Serena in the centre. They had just finished eating and, like me, wanted to continue walking. Not knowing where we were going, we followed the road and tramped on into the night. The Way followed a small confined valley with a motorway high above. Being so late the motorway was empty. We only had the light from my small head torch. Five kilometres later we found the small village of Pereje. We were all very tired by now and looked around for a suitable place to put down the sleeping bags. After trampling around the village and walking lost over a few gardens, we returned to an exposed cafe terrace and set out the sleeping mats and bags. It was 2am. As we settled for the night the cafe owner opened a window, obviously hearing the commotion, and simply said ‘Good Night’. 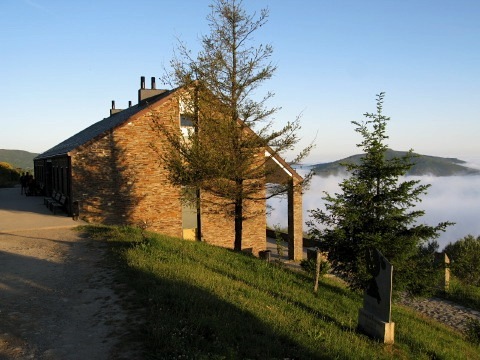 Deep sleep followed after a few chats and some laughter concerning our unusual albergue for the night. It was a cold chill morning in Rabanal del Camino. Mist lay in the valley below and the sun struggled to add some heat to the day. It was early when I left the albergue. 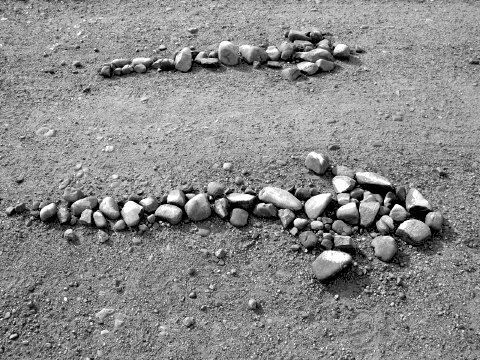 Near the main street, I saw a young couple arguing about which direction to go. They were heading back the way they came yesterday when I stopped them. They were totally confused. We were all heading West and the sun was rising in the East so I did not understand their confusion. Surely a simple deduction I advised. They seemed not to be amused. The days of GPS have their effect on the basics of navigation! Not long after I passed them panting on the hill. They were half my age. I felt that they did not see the world around them or that they were not looking. 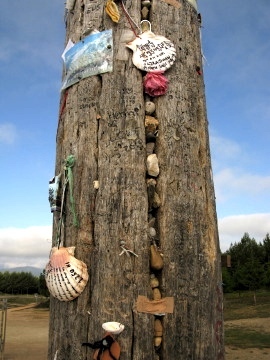 The Camino climbed slowly out of Rabanal del Camino. Looking back to the view of the village and the church in the early light was a delight. I was climbing higher and the change of scenery was a refreshing change after so many days of ‘flat-land’ walking. 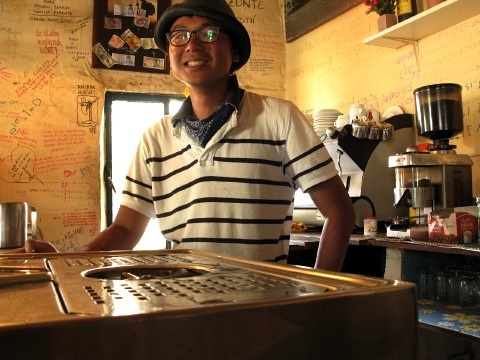 In the tiny hamlet of Foncebadon the only sign of life was at a small cafe. I had a coffee. The owners kindly gave me a free yoghurt drink for ‘energy for the Camino’! Foncebadon was wonderful. It was composed of so many very old buildings, some partly collapsing, others fully renovated. This had been a thriving village in the past and had only recently been revitalised. The sharp morning air at this higher altitude gave me a wonderful feeling of euphoria. Walking in the cool of the morning was a wonderful thing! Gorse bushes lined the Way and their smell was calming as the day heated up. 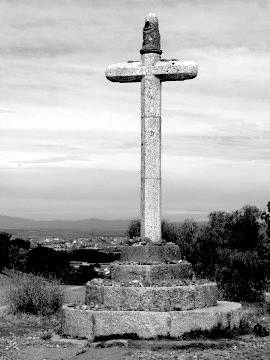 After a few kilometres I arrived at a significant monument on the way to Santiago de Compostela – the Cruz de Ferro or Iron Cross at 1504 metres above sea level. 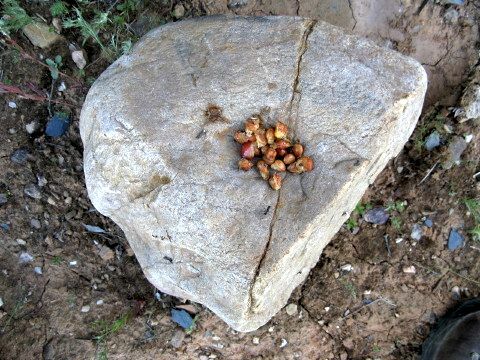 Traditionally pilgrims brought a stone from their home and tossed it onto the cairn by the cross. It was a magnificent stone pile with the simple cross atop a tall mast. There were great views across to Monte Teleno, at 2188 metres, the highest mountain in the area. 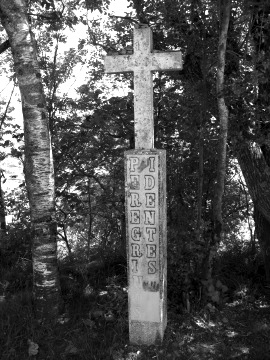 After the Iron Cross is was all downhill to Ponferrada some 25 kilometres away. I enjoyed the descent. 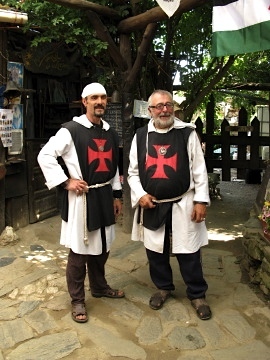 Soon there was the small hamlet of Manjarin solely populated by Templar Knights. 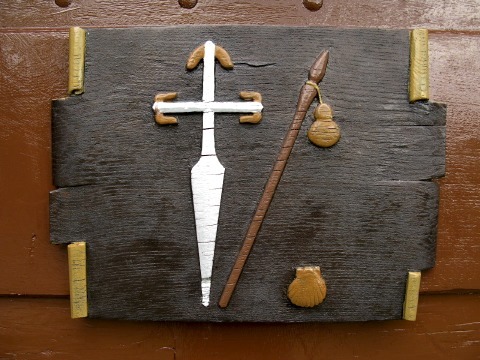 This group offered the pilgrim food and drink and sold Tao crosses as well as souvenirs to fund their existence. Every hour they performed prayers for pilgrims to help them on their way to Santiago. I could not begin to imagine what a tough existence they faced especially through the Winter months when the their village was often cut off from the outside world. There were cats everywhere and the atmosphere was one tranquility and a dedicated sect. Soon after I came across a woman selling fresh cherries in the middle of a wood. The Camino truly had a spiritual feeling of true enlightenment today. There were police out on horses too – there was a large military base in the area that trained the police in mountain rescue and patrol. They helpfully pointed me in the wrong direction! After tramping across some rocks and scrub I regained the Way. I caught up with the two Serenas from Italy. They were admiring the fantastic vistas over Ponferrada. 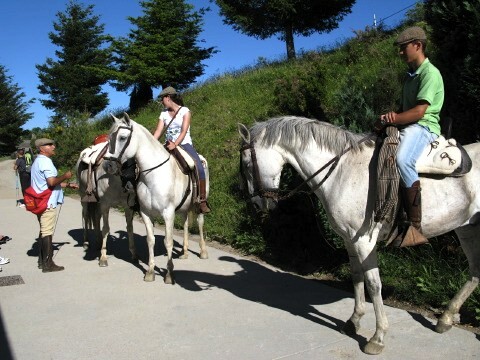 The Way continued on a long descent with the most fantastic views to the village of El Acebo. By now it was hot even though the altitude ensured that the air was fresh. 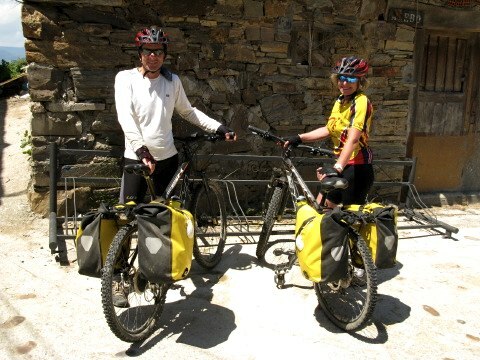 I stopped for some lunch and met a couple from New Zealand who were cycling the Camino! 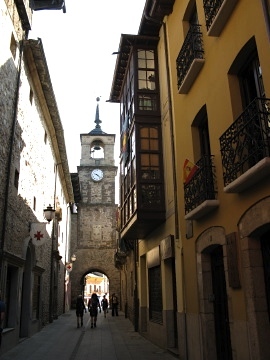 El Acebo was a attractive village and quite a centre for day trippers from the city of Ponferrada. 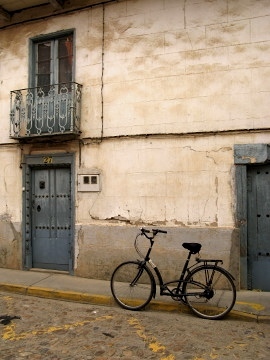 The next village of Riego de Ambros was similar in that there was a lot of regeneration of the buildings. I stopped again for a snack before finally descending on a narrow overgrown track through hot, dry and rocky terrain to Molinaseca. It was a relief to arrive at the town as by now the heat of the afternoon coupled with the lower altitude was making walking quite exhausting. 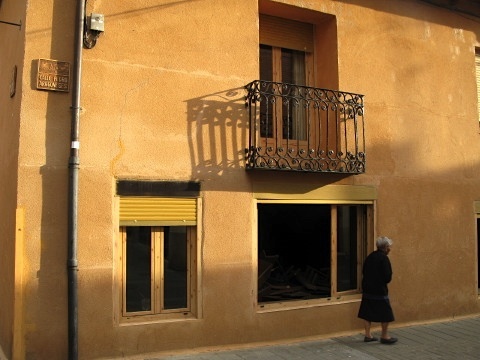 The albergue in Molinaseca was basic and not very clean. I met some walkers who recommended not staying there, but for me it was a bed for the night. 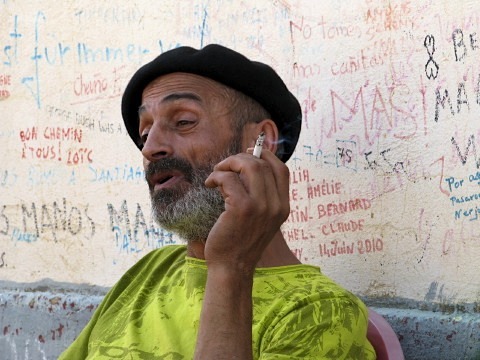 The man who ran the albergue was quite a character. He was shouting at two pilgrims when I arrived. They were sitting on beds that were not their own beds. He laughed one minute then flew into a temper the next in a bizarre but amusing welcome. I left to take a walk into town heading back to the river by the old Roman bridge. The river was wide and deep and the water icy cold. After stripping to my boxer shorts, a wonderful swim followed, cleansing after the heat and dust of the afternoon’s walking. I searched for a photographic exhibition that was on somewhere in the town. 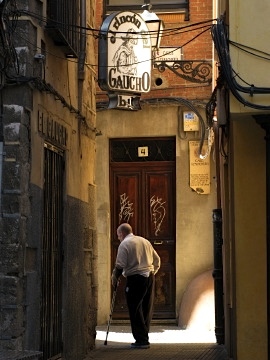 It was about the Camino and I was keen to see the photographs. I did not find it. I went shopping instead. Returning to the albergue there was a large wedding in progress with many people in the street. There were fireworks and people celebrated in all the bars and restaurants of the town. Back at the albergue I cooked up some dinner with the others and we sat in the late evening heat laughing and joking with yet another World Cup match blaring in the background. 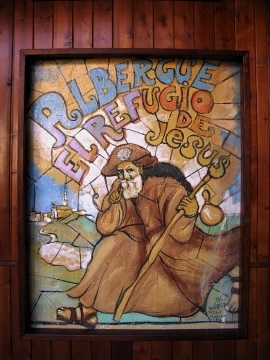 The albergue manager had become more stable and offered us some Orujo before bed. It was more appealing to sleep outside on the beds surrounding the albergue. I drifted into a deep sleep in the cool air of the night. TIP: There are some good places to swim in cool waters along the Camino. Make sure you take your swimming gear! Its so good after a long day in the heat. I met Patricia just after breakfast (sorry, I don’t have a photograph of her even though we met and walked several times!). She had not slept well. During the night a group had arrived. 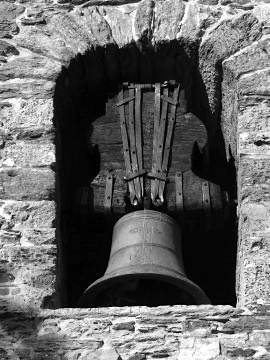 I refrain from calling them pilgrims as they were apparently loud and boisterous even at 1am – not pilgrim behaviour. When Patricia asked them to keep the noise down, they just told her to put in her ear-plugs! The group had managed to wake several tired and angry pilgrims that night. At the end of the town the Way crossed a large plateau before climbing to a small village. I stopped there for coffee with others. The morning was sunny and fresh and ideal for walking. Continuing on there was another small village before passing through some wonderful land of grasses and small trees. There was a large lake amongst the trees to the right of the Camino. There I saw Patricia sitting silently by the lake. I thought it best not to disturb her. The blister I had the previous day was behaving well. The night before when I arrived in Hospital de Orbigo, the man in the Albergue San Miguel had kindly offered to clean and dress the blister. He had done a good job and the dressing was holding up well. Others had similarly benefited from his paramedical skills. I had been lucky with blisters but it appears that no matter how comfortable your boots are, blisters can happen at any stage of this enormous walk. 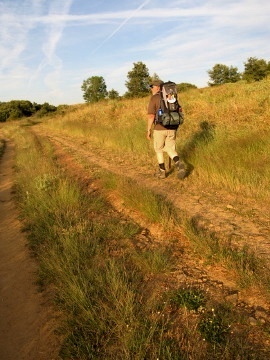 It was good to be on the real Camino again – away from civilisation, in the country, in nature, gentle wind and sun. 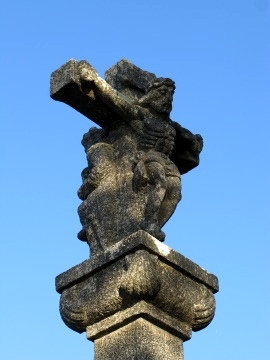 At the top of the rise was an unusual modern homage to pilgrims. A statue of a pilgrim was amongst the bushes. Everyone stopped to take a photograph. It was an amusing sight. On the side of the Way were groups of rocks. Sometimes they were just piles, sometimes they had been arranged into letters or shapes by passing walkers. 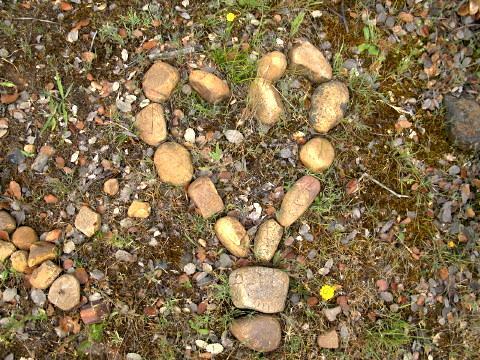 There were many stones formed into heart shapes. 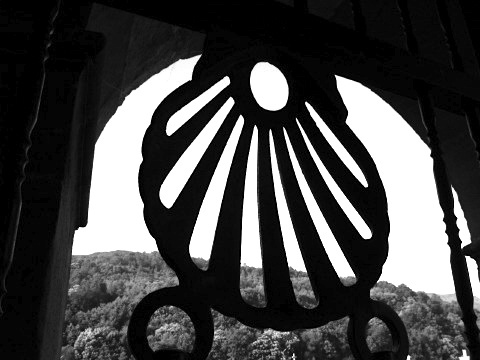 The heart is omnipresent on the road to Santiago de Compostela. At the next summit across a wide plain was a small barn with a stall. A young man there was offering free fruit and drinks to passing pilgrims. We talked for a while. He wanted no payment for what he provided. 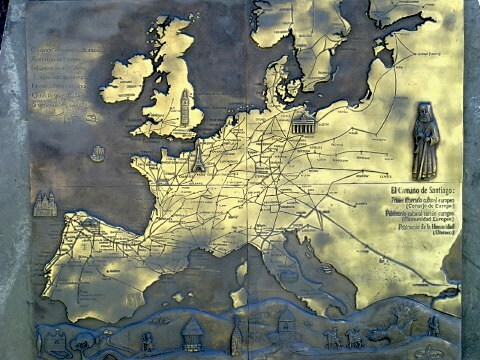 He had completed the Camion twice and had also walked from other parts of Spain to Santiago. He was currently on the twelfth day of a twenty one day self imposed fruit only diet. He lived in the collapsing barn with two dogs that belonged to a local shepherd. Soon the Crucero de Santo Toribio appeared with wonderful views of Astorga in the distance. A long descent followed and within an hour I was approaching the old Roman walls of Astorga town. There were plenty of attractions and historic buildings as well as a helpful tourist office. The Bishop’s Palace, built by Antonio Gaudi, is not to be missed! 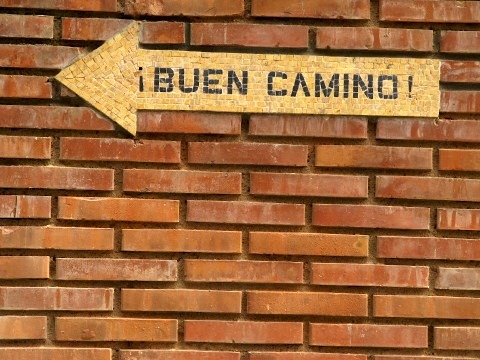 There were many more pilgrims here and later I found out that it was where the Camino Frances meets the Via de la Plata (Camino Mozarabe). Just as I was leaving town there was a small cafe where I saw Alain. I had met him a few times before and joined him for a lunch of tortilla sandwich. Alain was from Switzerland and had set off from Lausanne. He wore a distinctive black hat decorated with wild flowers. Every day he would pick new flowers to adorn the hat. Soon Simon turned up, chatted for a short time, then headed off. He returned to our cafe half an hour later saying he had become lost and ended up in the wrong village! What followed after Astorga was a magnificent wide valley rising slowly towards the mountains. Alain and I walked together and we agreed how much the scenery looked like the African savannah. It was a truly spell-binding landscape with several villages along the way. I was struck how the villages were so clean with so many cafes and accommodations. It appears that there had been a lot of rural tourism funding pumped into the area which was otherwise devoid of employment. 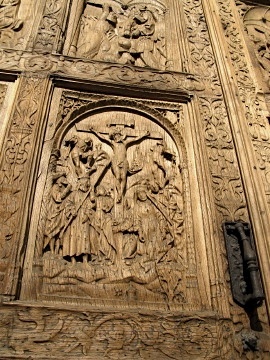 It catered well for the sudden increase in the number of walkers, many of who commence their trek to Santiago in Astorga. I kept walking. Alain wanted to stop at the next village but my heart was set on reaching Rabanal del Camino, the end of the ninth stage of the Codex. We parted ways and at El Ganso I saw Simone and Jasmin again at the small basic albergue. They had decided to stop there for the night as Simone was tired. It was getting late but I was compelled to continue the final eight kilometres to Rabanal. The valley spread out to the south and it reminded me of Scotland. The hills were bare with a few patches of snow still clinging to the sheltered recesses. 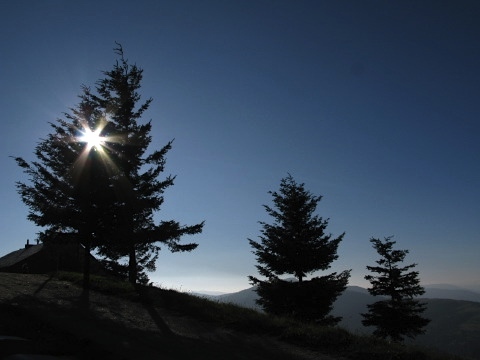 Pine woodlands offered fragrant memories. The wind was increasing in intensity as I arrived in Rabanal del Camino. I purchased some fresh fruit and vegetables at a small shop there then checked into the municipal albergue. I cooked then ate heartily in the garden shelter as the night fell, the wind blew and the rain started. I had a great feeling of simple contentment as I retired for the night away of the approaching storm. 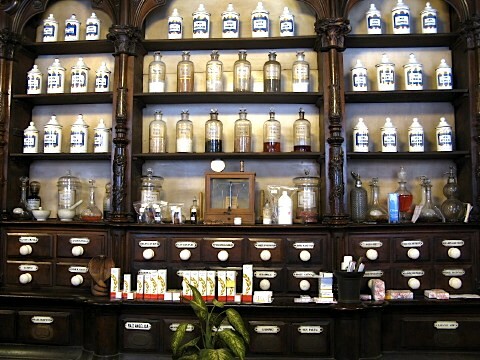 TIP: Many of the albergues have trained staff experienced at dealing with blisters and other ailments. This walk can be difficult at times and their service is invaluable and comforting on such a long walk. Thank You! Please thank them too! I had heard that Kaas was suffering from tendonitis. I had not seen him for a while so that explained his absence. He had been advised by a doctor to take several days rest which was what he was doing back along the track. I also got a message from Lorenzo. He was approaching Astorga which was quite a few kilometres ahead of me. He had been walking night and day covering an impressive number of kilometres since we last met. As I left Leon, the Way passed though the suburbs and industrial estates of the new city. Climbing slowly it was only at La Virgen del Camino that the city was left behind. Briefly I chatted to Deirdre who had stopped there for a coffee. I though that she was further ahead and it was good to catch up. 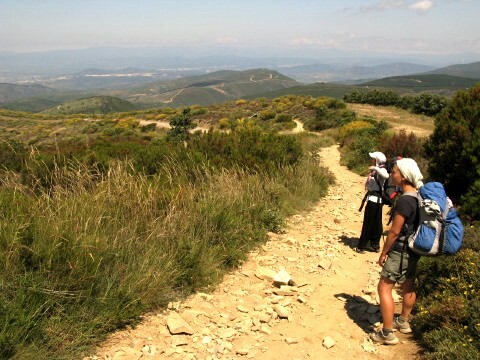 After La Virgen del Camino there was a choice – to walk along the busy N120 road or to walk overland through dry grassland. Wanting a quiet walk, I chose the slightly longer route into the hills. Shortly after I met Julie from Saint Etienne in France. For some reason she had heard about me from others on the Camino and said that she was glad to meet me at long last. 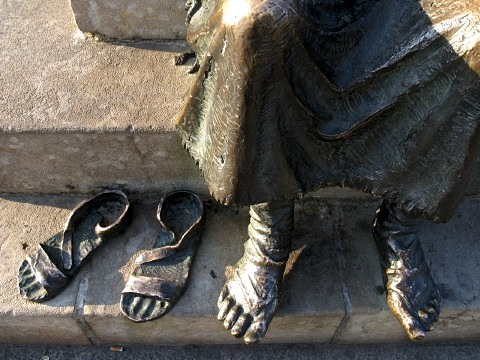 She asked about all the problems I was having with my feet each day and how I coped camping outside each night. I had no unusual problems with blisters nor did I camp outside each night! Strange how stories can spread on the Camino! Julie had started her walk from her front door five days before me and was heading all the way to Santiago de Compostela. She rarely, she said, stayed in albergues preferring instead to ‘wild camp’. She was studying languages and hoped to become a translator after university. Julie was a fast walker and after an hour or so after buying some fruit from a roadside seller, she steamed ahead and I never saw her again. An interesting person that I admired for camping each night along the Way. 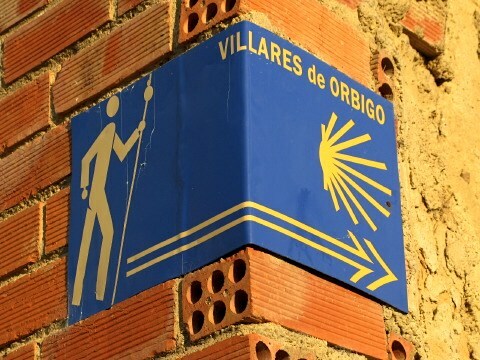 The true spirit of the Camino. At Chozas de Abajo the sun had become intense. I stopped at a small bar for lunch and ate hungrily on a tortilla sandwich. It was a dusty, deserted place with the sounds of a rock radio station playing in the background. Three Australians arrived exhausted at the bar and I chatted with them for a while. I thought I had met them in Leon but I was wrong. Or was it the heat? Was I delusional about their identities? They told me about a good albergue in Villar de Mazarife that had a pool. I had missed a swim in Boadilla del Camino so decided that this would be the goal for the day. It was not so far and I was getting lazy anyway. The heat was so intense that the thought of a cold swim was just too much to resist. The albergue in Villar de Mazarife was fantastic. A large garden had a raised concrete pool in the middle of the large garden area. The soft damp grass under foot felt wonderful after I removed the walking boots. 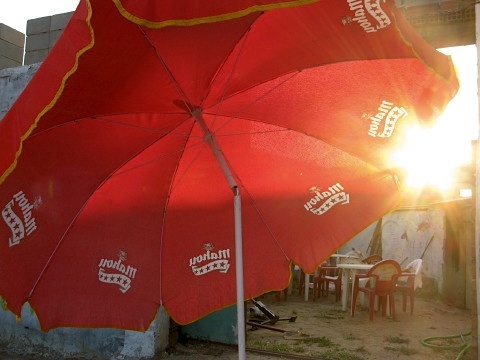 There were lots of chairs with umbrellas to shelter from the sun. It was a welcoming place and perfect for the tired pilgrim. I just had a good feeling about it and knew it was the place to stay for the night. I had unfortunately just missed a delicious lunch of paella. There were many familiar faces – Moritz and Ruth amongst them. The albergue had dormitories, in fact rooms, for four persons – a luxury. 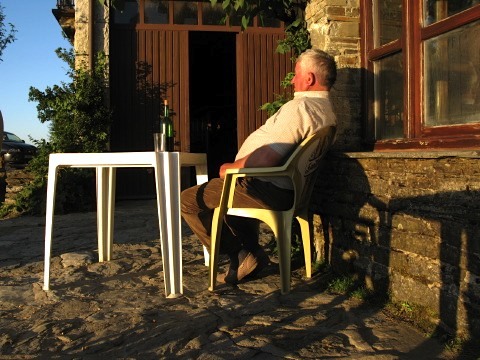 You could even sleep on the outside deck of the albergue for a cheaper price. I must have been tired as the bright red chairs looked very welcoming. 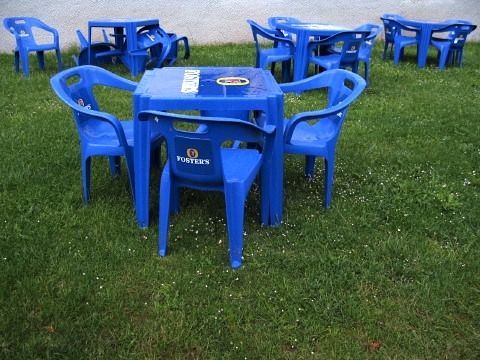 I had seen some bright blue chairs in Roncesvalles – maybe the pilgrim is attracted to such chairs after so much walking! In the centre of the village I bought some provisions and juggled for the kitchen facilities with a group of Italians. 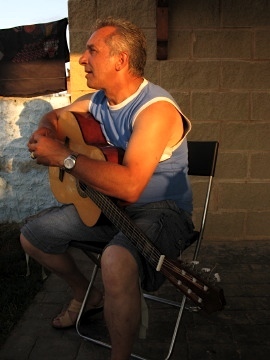 Later in the evening everyone sat round a large table in the garden while Pepe, a friendly local, played flamenco and Spanish music on his guitar. I finally got my swim in the late evening light before everyone walked to the outskirts of the village to sit by a pond singing and playing guitar. It was late when we got to bed but it had been a great day. TIP: When everyone is taking one particular route it is worth considering an idea to take the alternative route. Usually it can be quieter and more interesting. Any route that stays away from a road is the best choice. I awoke early to the shining sunrise not really sure where I was. I had slept well in the bivi bag on the edge of town. Hungry I headed into El Burgo Ranero to find a cafe. There were two next to each other in the centre of town. At the first cafe I bought some coffee and croissants. At the bar were two policemen. They were looking at me laughing and smiling. ‘We saw you sleep last night’ they said. They had spotted me during the night asleep near a road but had decided not to wake me. They just laughed at the way of the pilgrim. I had been lucky as often they will arrest people sleeping ‘wild’. Its illegal in Spain. The morning sun was bright and the air crystal clear. I left town after breakfast past some marsh land alive with frog and bird song. What followed was another long straight stretch of over twelve and a half kilometres to Reliegos. It would be all that I could manage that day. The heat quickly built and the sun was intense. 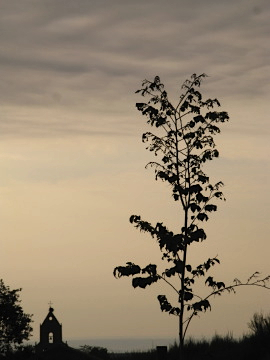 Efforts had been made to plant trees along the length of the Camino however the trees were young and gave little shade. It was only six kilometres before the efforts of yesterday’s thirty five kilometre walk were felt. I was exhausted. There was a shady rest stop where I lay on a concrete pique-nique table and slept again for over an hour. The trees rustled and the birds sang as I slipped in and out of sleep in the peaceful countryside. When I set off it was no better. The heat was almost unbearable, and the sun unrepentant in its ferocity. It was not so far to the next village that would definitely be the stop for the night. The longest few kilometres of my walk so far! Completing a long day’s walk was inevitably followed by tiredness the next. Its better to do twenty five kilometres a day or so and not to overdo it on any one day. Finally with a parchment thirst I arrived in the tiny village of Reliegos. I stopped at the famous bar near the centre. It was unique on the Camino. 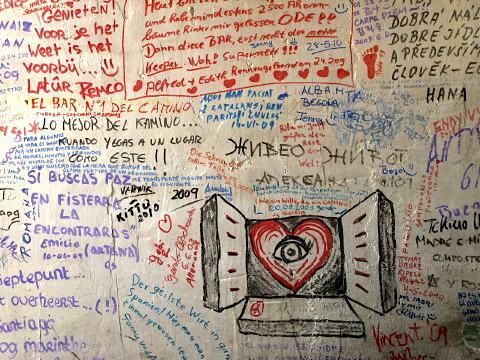 The exterior and interior walls were covered in notes, stories and memories of the thousands of pilgrims that had stopped there over the years. I met Patricia again but she was keen to continue. Patricia was a wonderful person. I never really got to know her well enough to discover what was worrying her. Soon after Moritz, Ruth, Daniel, Ricardo, Alex, Serena, Caroline and Ray arrived. We sat in the late afternoon sun chatting over a few cold beers. 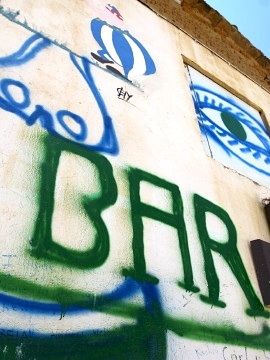 The owner of the bar was a wildly friendly man who simply slumbered in his long comfortable seat while directing his customers to go behind the bar and help themselves. He had few worries and enjoyed and excelled in providing pilgrims with some nourishment on their long trip. I don’t think he even cared too much about how much people payed. 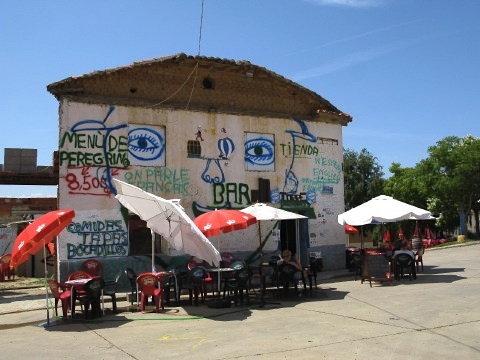 The albergue in Reliegos was simple, clean and friendly. I prepared an evening meal while others sat at the tables planning and plotting the next day’s offensive like a military campaign. GPS, maps, books and notes were all sprawled over the tables as each section of the next day’s walk was analysed in detail. 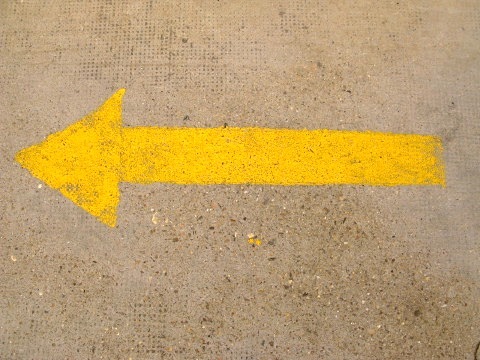 I just follow the yellow arrow. 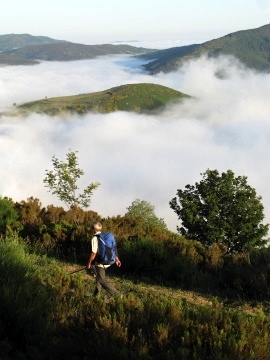 TIP: ‘Wild’ or ‘stealth’ camping is possible on the Camino and its good to do now and then. Just watch out for the police, especially in Galicia, as they can be tricky and you may find yourself having a free nights accommodation at their expense! 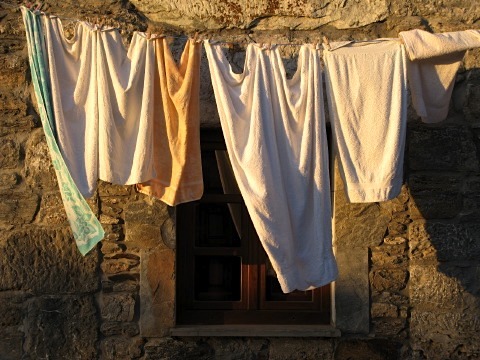 Anyway, for the pilgrim, an albergue is cheap, warm and provides a hot shower. The chance of spending a night under the stars should not be missed however!